We have one final translation from Nintendo Dream‘s interview with Zelda producer Eiji Aonuma… and it’s a big one. The latest excerpt is entirely about Majora’s Mask, and its creation. Aonuma reflects on the work he did for the game, speaks about the creation of Romani Ranch, Anju and Kafei, Pamela, and much more. Head past the break for our full translation. 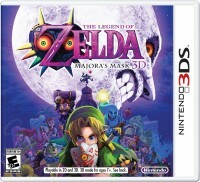 I’d say it’s very much worth a read if you’re curious about Majora’s Mask’s various elements! ND: Wasn’t it harsh [to complete the game] in a year? Aonuma: That’s right. For example, it has been a long time since I started working on Zelda, but I have almost never pulled an all-nighter. However, I did that once for the N64 version of Majora’s Mask. I did that together with Koizumi and (Takumi) Kawagoe. We were responsible for a movie which Miyamoto had rejected the day before. We had to do it again until the next day and there was barely enough time. It left a lasting impression as I worked quietly in a room with no one around. ND: From a fan side of view, it generates strong feelings how Mr. Aonuma and Mr. Koizumi made a game together and later got deeply involved with Zelda and Mario series, respectively. Aonuma: Even though that is how it turned out, I nor Koizumi didn’t think about it at the time (laughs). Speaking of our roles back then, Koizumi was responsible for planning events inside Clock Town and I planned surrounding areas, including dungeons. ND: So the responsibilities were divided between inside and outside. Aonuma: That is because Koizumi wanted to do a time management system and it was a good fit for Clock Town. ND: I see. Mr. Koizumi came up with the time management system and was responsible for things related to it. Aonuma: But I wanted to make [things for the time management system], too. I said I wanted time management outside [of Clock Town], but the gameplay becomes strict if the passage of time can be seen in dungeons and on the field. That is why I was told to include time management only in Clock Town. ND: Even though being the director! Aonuma: That’s right. It was really frustrating so I put some occasions in the game. ND: What kind of occasions? Aonuma: For example, the location of the frozen Goron elder changes depending on day. Isn’t that really humble? ND: The big boulder blocking the Milk Road changes depending on time. Was that Mr. Aonuma’s idea? Aonuma: That was Koizumi’s work. Because Cremia is at Milk Road, that place is a part of the time management content and received the same treatment as Clock Town. Despite Koizumi being told to only plan Clock Town, gradually he encroached up to that area! ND: Despite dividing responsibilities between inside and outside (laughs). Aonuma: When cattle mutilation became a topic at the time, Koizumi wanted to do that content. ND: The mysterious phenomenon in which aliens use cattle for their experiments. Aonuma: But that content couldn’t be done within Clock Town. Therefore we wanted to have a vast place like a ranch. Also it would have been weird if there wasn’t a ranch following Ocarina of Time, so Romani Ranch was born. ND: So the ranch was born when you matched the material you wanted to make and the world of Zelda (laughs). I heard Mr. Aonuma and Mr. Koizumi also used other personal experiences from during the development. Aonuma: It’s almost always like that (laughs). There are really many cases when we had personal themes as a starting point for production. ND: The wedding of Anju and Kafei was like that, right? Aonuma: That’s right. It was born from the Taepodong uproar of the time. ND: There was news that North Korea was preparing to launch Taepodong missiles. Aonuma: We were attending a wedding of a staff member and were talking with Koizumi and the others: “Come to think of it, it’s somewhat strange to come to a wedding in a situation when missiles may fall down today.” The discussion progressed into noting how it would also fit the setting of a falling moon and whether to do a wedding in the game. Now that I think of it, no matter where we go, we always talk about work (laughs). However, I didn’t mind it at the time! ND: Don’t you make it sound like you would mind it now? Aonuma: My family hates it now so I pretend not to be thinking [of work] (laughs). Aonuma: However, I had thought the material I wanted to put in the area, like Music Box House and reversing top and bottom of the Stone Tower, from the beginning. Particularly Pamela was named after a part of a Bossa Nova song. “Pamela, Pamela ?” was stuck in my head at the time (laughs). ND: Did you decide [to add] a character based on a name?! Aonuma: Although it was based on wanting to have material involving a little girl. Nevertheless, I imagined Pamela as a foreigner girl when creating her just from the name, but when I looked at the finished [design], I decided she was Japanese. Aonuma: But when I saw that figure moving around, I got the feeling this child was brave. That’s why I created a little troubled setting for her father. ND: Did the father exist in the beginning? Aonuma: It was decided to only have Pamela and there wasn’t a Gibdo father. ND: What did you think when you created the event for Indigo-Go? Aonuma: While the Goron one is like a hero story, I thought to make stories for masks relatively sad. That is how I thought the story of Mikau and his love for children. When considering relations for those characters, I ended up thinking a band could be good. I joined a band as a student and I’m still playing wind instruments so I thought a band would give a youth-like feeling. When I discussed this with Koizumi, we thought “let’s make them have a concert in Clock Town”, and so the setting was quickly decided. We wanted to connect Clock Town and the surrounding areas so that’s why this plan got great support. ND: Speaking of Mr. Aonuma back in the day, I think the dungeon production has a strong image. In particular, we talked about turning the Stone Tower upside down a little while ago. It was noted that Mr. Aonuma had cherished the idea from the olden days. Aonuma: Noo, wasn’t it a plan? (laughs) When you first turn into Deku Link and go to Clock Tower, isn’t the corridor warped? It was the same with a corridor in Forest Temple in Ocarina of Time. To tell the truth, the data was used as it was, but the viewpoint was changed. ND: I certainly see that now when you mentioned it! Aonuma: In Ocarina of Time, you could walk in the twisted corridor and the shape didn’t change, but in the N64 version of Majora’s Mask, it looked like the corridor twisted and squeezed while walking. I have thought a room twisting and going upside down is an interesting mechanism since Ocarina of Time.